Jamie Dimon isn’t fazed by rising market volatility and the possibility of a trade war. JPMorgan Chase reported earnings and revenue for the first quarter Friday morning that topped Wall Street’s forecasts. The bank posted a profit of $ 8.7 billion for the quarter, an increase of 35% from a year ago. Results were strong across the board, with JPMorgan Chase posting solid increases in net income at its consumer banking, investment banking, commercial banking and wealth management businesses. No wonder Dimon, the bank’s CEO, remains upbeat. “The global economy continues to do well, and we remain optimistic about the positive impact of tax reform in the US as business sentiment remains upbeat, and consumers benefit from job and wage growth,” Dimon said in a press release. But during a conference call with reporters Friday, JPMorgan Chase chief financial officer Marianne Lake said that the bank has not yet received a significant benefit from tax reform — it likely will come later in the year. 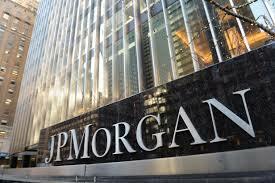 JPMorgan Chase(JPM) forecasts a solid 2018 overall. The bank said that net interest income for the year, a key measure of profitability, will be in a range of $ 54 billion to $ 55 billion this year. That would be a nearly 10% increase from last year’s profit of $ 50.1 billion. But the bank’s bullish outlook comes just one week after Dimon expressed concerns about the political divide in the United States — particularly the debate about immigration — in his annual letter to the bank’s shareholders. “We need to resolve immigration — it is tearing apart our body politic and damaging our economy,” Dimon wrote. Lake acknowledged trade tensions between the US and China as well Friday. She said the bank is hoping that the two nations will reach an agreement soon, but that it remains “business as usual for now” for many of its corporate clients and that CEOs are still bullish. Nonetheless, Wall Street seemed pleased by JPMorgan Chase’s earnings and guidance. Shares were up in early morning trading Friday, as was the broader market. The bank’s results kick off the so-called earnings season for the first quarter. Rival banks Citigroup (C) and Wells Fargo (WFC) also reported first quarter earnings that topped forecasts Friday while Bank of America (BAC), Goldman Sachs (GS) and Morgan Stanley (MS) are due out next week.